The liner notes of this album call Kidd Jordan (ts), Alvin Fielder (dr) and Peter Kowald (b) “masters” and hardly ever has this term been more justified. All of them started in the 1960s, they are veterans of this music, Jordan and Fielder are still active musicians (fortunately Fielder has recovered from serious illness), it is just Peter Kowald who died of a heart attack at the age of 58 at his friend’s William Parker’s home – only five months after this trio performance was recorded in 2002. However, while Jordan’s and Kowald’s careers are very well documented (e.g. there is another new Jordan album with Borah Bergman, William Parker and Michael Wimberly just being released), this cannot be said about the music of Mr Fielder, after all an AACM founding member who played with Sun Ra, Muhal Richard Abrams, Fred Anderson, Roscoe Mitchell, Clifford Jordan or Ahmed Abdullah (among others). This might be due to the fact that he moved back from Chicago to Mississippi to take over his father’s pharmacy in the late sixties but on the other hand he remained a creative musician. His connection with Kidd Jordan goes back to the Improvisational Arts Quintet which they both established in the early 1970s. So, NoBusiness deserves praise just for releasing another collaboration of these two wonderful musicians. Usually I do not advise listeners how to listen to an album but in this case it might be interesting to start with the second CD, the Jordan/Fielder duo recorded at the Shed Recording Studios in New Orleans and the Eldorado Ballroom in Houston. The first track, “Liftoff”, literally lifts the set off, but not bumpy like an albatross, rather like an eagle that jumps off a ledge to glide through the air. The composition is like an advance notice for the two central pieces, “Duo Flight” and “E. Fashole-Luke”. The first one – a breath-taking 20-minute improvisation – presents both musicians on top of their skills, it seems as if they were dancing with each other – and they do this with such perfection as if they were the Ginger Rogers and Fred Astaire of improvised music. I have hardly heard Jordan playing so energetic and boisterous lately and Fielder, who was quoted in George Lewis’s “A Power Stronger Than Itself”, that he wanted to play his bebop as loose as possible and his free music as tight as possible, exactly proves this here. His drum style is highly musical, his technique exquisite – just listen to the cymbal light-footedness in the opening of the track and his solo. “E. Fashole-Luke” is based on an addictive sax blues riff and Jordan pulls out all the stops, he gives us everything, his skills, his outstanding technique, his polytonality, his spirituality, his stylistic awareness, and his emotionality. It’s a joyride through great black saxophone music from John Coltrane to Albert Ayler and Roscoe Mitchell, it is no exaggeration to compare Jordan’s and Fielder’s performance here with the one by Coltrane and Rashied Ali on “Interstellar Space”. There is nothing left to say and it is something you realize from the very first second of this record: Kowald and Fielder usher us in with the greatest subtlety, Jordan puts on gospel lines before the track takes us to new territory – and the musicians are curious enough to explore this musical area. Although the CD information says that there are eight tracks it is actually one concert which is covered here, with beautiful solos interspersed, and an encore. My favorite part, “Trio II”, represents all the qualities this album displays – it is a deep listening experience for the musicians and the audience, it is a service touching the strings of your heart. What a great album at the end of a great free jazz year. 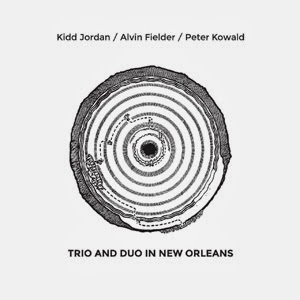 “Trio and Duo in New Orleans” is available as a double CD. The vinyl edition is called “Live in New Orleans“, it is limited to 300 copies. It only includes the trio session. You can buy it from the label where you can also listen to two sound snippets, or at instantjazz.com. thanks for the mouthwatering review. But I would like to point out that there's another german Free Jazz bassist which shouldn't go unnoticed: Buschi Niebergall. Although he stopped playing in 1980 and died ten years later his contributions are invaluable. Listen to his trio recordings with Michel Pilz f.e. Ask Evan Parker what a single low note played by Buschi Niebergall could trigger in his imagination. I write this for historical balance. Wow, what a great find, Colin. Thanks for the link. This is superb. I absolutely agree with you, Ernst. Niebergall is simply wonderful, it's a tragedy that he had to go so young (he died at the age of 41). The fact that he played on Schoof's European Echoes and Brötzmann's Machine Gun proves you right. Of course Niebergall is a great bassist, I absolutely agree with you, Ernst. It is a tragedy that he had to die so early (aged 41). The fact that he played on Schoof's European Echoes and Brötzmann's Machine Gun also proves that you are right.